Please edit a post and set it as slider post. 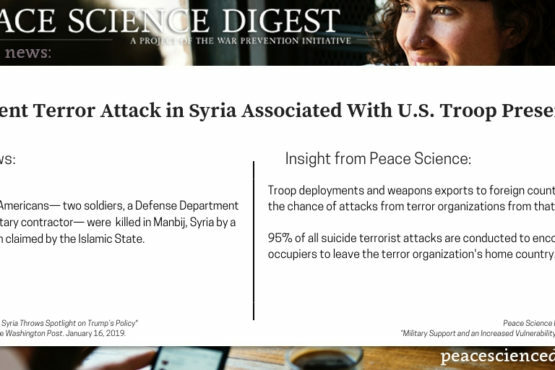 Foreign military presence increases the likelihood of terror attacks, especially suicide bombings like this week's attack against U.S. troops in Syria. Now in its 5th year, the conflict in South Sudan has claimed tens of thousands of lives, displaced more than four million, and is one of the main causes of hunger in the country. New data from the Costs of War project at Brown University shows that the United States' war on terror has spread across 40% of the world’s nations. 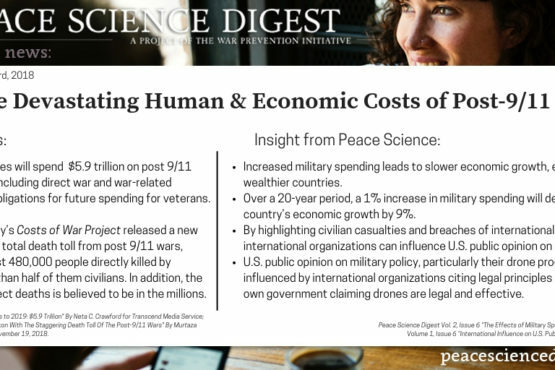 Peace science provides insight into the disastrous human, social, and economic toll war has on all parties involved. 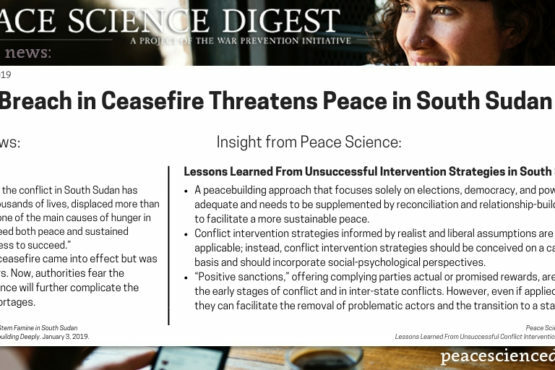 December 15th, 2018 marked the fifth anniversary of South Sudan's civil war. To ensure that the latest peace agreement meets a better fate than the previous failed attempts, a broader political settlement that shares power across the country’s diverse political and social groups and regions is needed. Gender equality is everyone’s battle and it is critical that men understand that this includes them. Gender inequality has profound consequences for all of humanity--there is no area where this is more clear than in matters of peace and security. Under the purview of the Anti-Personnel Mine Ban Convention, Mauritania is now free of landmines for the first time in four decades. Committing to weapons treaties like these can also influence nonstate actors to do the same. 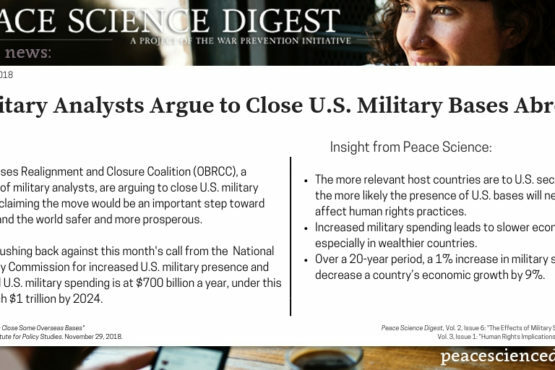 A bipartisan group of top military analysts has written to Congress and the Trump administration calling for the closure of U.S. military bases overseas, claiming the move would be an important step toward making the U.S. and the world more secure. Recent U.S. elections saw a steep rise in female political representation. This is a vital step towards greater gender equality and inclusion, but Juliana Restrepo Sanín points out a challenge: "in a political landscape increasingly marred by violence and bigotry, how can violence against politically-active women be prevented? Ensuring that elected women have the chance to represent their constituents and advance their political agenda in equal conditions as men is imperative if the principles of democracy are to be sustained." This week, the U.S. Senate voted to consider ending America’s role in the Saudi-led war in Yemen. Such a move would mark an end to the United States participation in a civil war that has led to the death of thousands and suffering of millions. Though, peace science warns of the lasting effects of foreign military support. A new report from Brown University's Cost of War project provides updated estimates on the devastating human and economic costs of the United State's post 9/11 wars in Iraq, Afghanistan, and Pakistan.